When Japan was hit by the strongest earthquake ever recorded in the country’s history in March 2011, Tohoku University Professor Shunichi Koshimura was in Tokyo Station, waiting for a next bullet train toward his hometown Sendai at the moment of the 9.1 magnitude quake. A tsunami warning was raised by the Japan Meteorological Agency three minutes after the earthquake was triggered, and an hour after the devastating earthquake, waves of up to 30 feet high hit the Japanese coast, sweeping away cars and infrastructures, including nuclear reactors and power plants in Fukushima, about 140 miles or 230 kilometers from Tokyo. Over 18,000 people were confirmed dead or missing, according to Japan’s Fire and Disaster Management Agency. Koshimura, who teaches civil engineering, particularly in coastal engineering, and has expertise in tsunami modelling using computer simulation, talked about his experience, insights, and motivation to Singapore Business Review about how his personal experience in 2011 led him to leverage the development of technology in providing more reliable tsunami inundation forecast information to his native country, Japan, and how these technologies can be transferred to other countries. 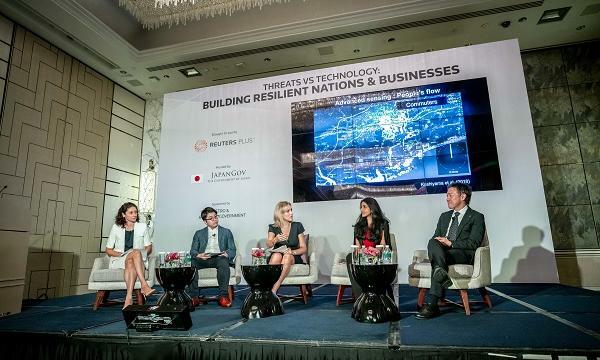 This heightened focus on leveraging technology to combat vulnerability and threats come at a time when countries, are also becoming more vulnerable to the effects of climate change and extreme weather events. According to the United Nations Office for Disaster Risk Reduction, economic losses caused by climate-related disasters have soared over the past two decades, with $2.25t. For the 2011 earthquake and tsunami alone, Japan is estimated to have lost over $300b or about 6% of the country’s total gross domestic product in 2010. This is not mentioning the thousands of lives lost from these natural disasters globally that could have been prevented if there were enough information-driven, technology-based solution in place. Technology can be extremely helpful in all phases of a disaster, from preparation to dealing with the aftermath and helping people and affected areas in recovery and rehabilitation. This is the case for WOTA, a technology firm that is trying to leverage technology, artificial intelligence, and big data to optimise water treatment process. Water is one of the most important things that people needs, not just in post-disaster situations, but also in everyday life. Speaking to Singapore Business Review on the sidelines of the Building Resilient Nations and Businesses event in Singapore, WOTA chief executive officer Riki Kitagawa cited the experience of the 2011 earthquake and tsunami in Japan, where water became a serious issue for survival and sustainability of life and businesses in the affected area. Technology plays a big part in WOTA’s operations and outreach given that it allows the company to scale up at a more impactful range, while also providing a stark possibility of replicating the technology and know-how to other countries, particularly the mostvulnerable who are also considered as developing nations. Kitagawa noted that countries like Indonesia and the Philippines, two of the most vulnerable countries to climate-related disasters, can implement WOTA’s technology without the costly price tag because the company doesn’t require too much overhead given that majority of the process is automated through artificial intelligence and sensor systems, although people have to know how to use the systems.